As we continue our deep dive into the history of mid-engine Corvettes, we turn to the most recent of the mid-engine Corvette prototypes and concepts, the Chevrolet Engineering Research Vehicle III. The CERV III was the Corvette engineering team’s final attempt at sticking the engine behind the driver in their sportscar, that is unless new rumors in regards to a mid-engine C8 Corvette are to be believed. The CERV III was styled by chief Chevrolet designer Jerry Palmer, who also designed the Four Rotor Aerovette. 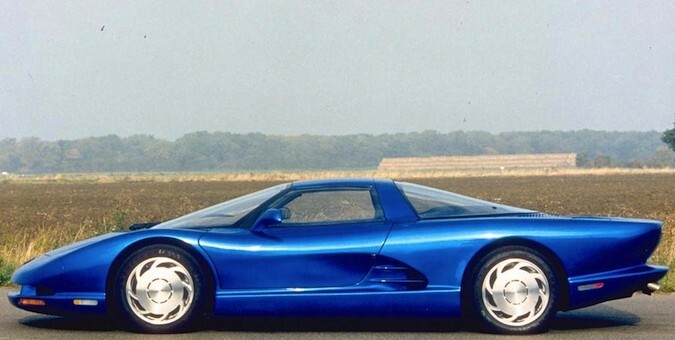 It made its debut at the 1990 North America International Auto Show after the inspiration for the car, the Corvette Indy Concept, made its debut in Detroit four years earlier in 1986. At the time of its debut the CERV III was one of the most technologically advanced concept cars of all time. Its one-piece body was made from a combination of carbon fiber, Kevlar and nomex and was reinforced with aluminum. It was powered by the a Lotus-tuned 5.7-liter V8 with Mahle pistons and twin turbochargers, making for an output of 650 horsepower, which would keep it competitive with supercars even today. It also had an estimated top speed of 225 mph. The CERV III was more than just outright power. It had a dual-disc braking setup on each wheel, which helped increase braking force. It also had an advanced four-wheel steering system and a viscous-coupling all-wheel drive system. Furthermore, the car had two transmissions, one a three-speed Hydramatic unit and another a custom two-speed transmission, making for a total of six gears. Of all the CERV prototypes, the CERV III was the most production-ready and the closest to reaching production. The Corvette marketing team decided there was no room in the Corvette lineup for such major changes and killed the program off, but the CERV III shows how serious Chevrolet once was about producing a mid-engine Corvette. Although this didn’t make it into a Corvette, the 4th generation f-body (Camaro / Firebird) borrowed heavily from this concept. Sloping windshield, large sloping rear glass, roof (and what appear to be removable panels, later making it as T-top), the B pillar and the roof bar, and of course, not to be missed, huge overhangs.